This is the strawberry jumper I bought after a charity shop trip a while ago! I have finally had the chance to wear it. I still can't get over how amazing the pattern on it is, I love the pop of red against the navy blue. What a great find! So cute and unique and the strawberries have me wishing for summer. Lovely outfit. love how you brought out the red in the sweater with lippy and a hot red bag! 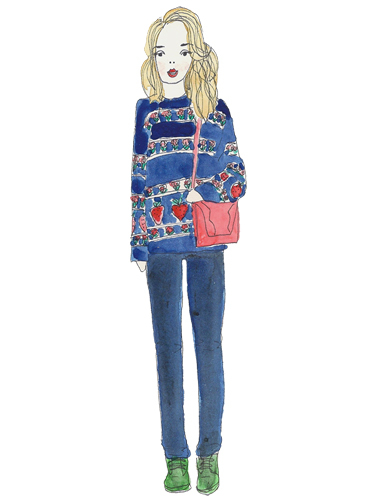 You look so cozy, loving the red lippy with the jumper and bag. Wish it was jumper wearing temperatures here. I have passed something onto you (check out my blog), hope you take part! very winteryy and comfy looking. i love your illustrations, they look so true to life! Love your jumper looks so comfy.